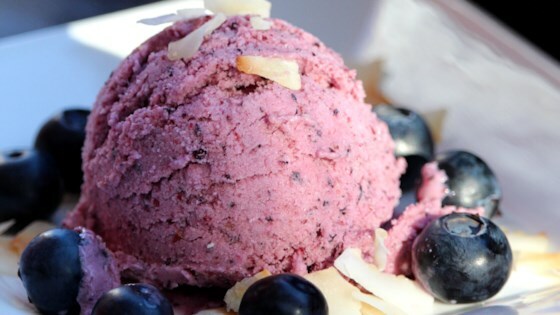 "Easy, vegan, sugar-free, no-cook delectable blueberry ice cream. Who said treat food can't be healthy? Serve immediately or freeze until firm. If it's thoroughly frozen, transfer to the refrigerator 30 minutes before serving for easier scooping, or divide with a thin, sharp knife." Pulse flax seeds in a coffee grinder until finely ground. Combine 1 can coconut milk, blueberries, and lemon juice in a blender; puree until blueberry skins break down completely. Add ground flax seeds, remaining coconut milk, vanilla extract, coconut oil, stevia, xanthan gum, and salt; puree until very smooth. Transfer blender container to the freezer to chill mixture briefly, about 15 minutes. Pour mixture into an ice cream maker and churn according to manufacturer's instructions, about 20 minutes. Transfer to a lidded container before serving. Use fresh or frozen blueberries (thawed) as desired. Adjust amount based on your preferences and the type of blueberries used. Wild blueberries have more concentrated flavor and color than domestic, so you'd need less. You may also substitute or mix and match with Saskatoon serviceberries, black currants, bilberries, huckleberries, blackberries, raspberries, strawberries, or any other berries instead. The stevia can be partially or wholly substituted with about 1 cup powdered erythritol or another sweetener. Instead of flax seeds, you can use the same amount of ground chia seeds, up to 2 tablespoons Ener-G® Egg Replacer™, or whatever you like to use in place of 4 eggs.